They are picked from the rocks and cliffs by hand when the tide receedes and are quite expensive. yukinori, yuki nori　雪海苔　"snow-nori"
This is a local kigo about the iwanori from Sado Island and along the coast of Echigo. They are given as an offering to the deity of the New Year on January first. Even Ryokan has written a poem about this nori. Nori (Japanese: 海苔) (Chinese: 海苔; pinyin: haitāi, Korean: kim or gim) is the Japanese name for various edible seaweed species of the red alga Porphyra including most notably P. yezoensis and P. tenera, sometimes called laver. The term nori is also commonly used to refer to the food products created from these "sea vegetables", similar to the Korean gim. Finished products are made by a shredding and rack-drying process that resembles papermaking. Japan, Korea, and China are the current major producers of nori. Nori is commonly used as a wrap for sushi and onigiri. It is also a common garnish or flavoring in noodle preparations and soups. Nori is most typically toasted prior to consumption ("yaki-nori" in Japanese). A very common and popular secondary product is toasted and flavored nori ("ajitsuke-nori" in Japanese), in which a flavoring mixture (variable, but typically soy sauce, spices and sugar in the Japanese style or sesame oil and salt in the Korean style) is applied in combination with the toasting process. Nori is also eaten by making it into a soy sauce flavored paste noritsukudani (海苔佃煮). A related product, prepared from the unrelated green algae Monostroma and Enteromorpha, is called aonori (青海苔 literally "blue nori") and is used like herbs on everyday meals like okonomiyaki and yakisoba. Great source of Iron and Calcium. 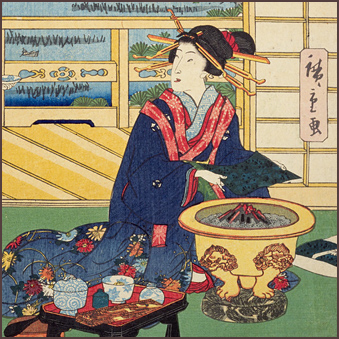 A lady is sitting next to a dinner tray, grilling the Nori for a moment over charcoal on a Hibachi brazier to make them crisp and more tasty. Nori is an indispensable element of any sushi meal. At first glance, the black sheets of dried seaweed may look unappetizing, but nori is a healthy, nutritious sea vegetable. The type called Asakusa nori was once synonymous with nori, but is now fast disappearing. The primary countries with nori-eating cultures in the world today are Japan, South Korea, and parts of China. In Japan, nori is a handy food item that is either used to wrap balls or rolls of rice or sliced into thin strips and sprinkled over various food items as a condiment. In the past, Westerners unfamiliar with nori were surprised to see Japanese people eating "black paper." But today, nori is widely recognized as a health food derived from the sea, and it can be found on the shelves of most natural food shops and supermarkets in the United States. When Japanese people hear the word "nori," most conjure up images of Asakusa nori. But the type that is sold today is invariably the type called Susabi nori, as it is almost impossible to find Asakusa nori on the market today. Nori in Korean is called gim, which grows from spores on underwater rocks and branches of sea plants. According to Chosen shokubutsu-shi (The Flora of Korea) by Korean culinary expert Chun Daesong, nori first entered Japan in the late sixteenth century following a military expedition to Korea by warlord Toyotomi Hideyoshi. 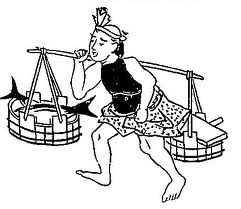 Nori was reportedly brought back to Japan, first to Hiroshima and eventually to Edo (present-day Tokyo), after which nori aquaculture began in Tokyo Bay. Great progress was made in aquaculture techniques following World War II. Nori is harvested much like green tea, with only freshly grown "sprouts" being plucked. Sprouts are soft while young, but they harden as they grow. Harvest periods are very short and yields small if the process is left completely to nature. Thus a method was developed to prolong the harvest period. Seedlings on nets are lowered into the sea until they grow to around 3 to 4 centimeters. They are then drawn up and preserved in a frozen state. When the nets are lowered into the sea again, the nori starts growing again. This method has more than doubled nori's harvest period. Nori usually refers to amanori (genus Porphyra), of which the Asakusa variety was once quite common. Most amanori freshly harvested off Japan's coast has a sweet aroma and a faintly sweet taste, giving rise to its name (amanori means "sweet nori"). Most amanori is found along the Pacific coast, in the Seto Inland Sea, and on the northwest shores of Kyushu in the upper intertidal. It is most commonly seen near river mouths, where water tends to have lower salinity. Asakusa nori is extremely vulnerable to changes in temperature and to seawater contamination and is highly susceptible to disease. It may only be natural, then, that this type gradually disappeared as pollution grew more serious in Japan. Growing Asakusa nori without acid treatment requires the use of healthy seeds. Shigemi Koga (58) thus frequently visits a fisheries research center that cultivates a type of Asakusa nori called Noguchi in June to check the growth of seedlings. In September he prepares the breeding grounds by inserting metal poles that will hold the nets, and in mid-October, when seawater is around 22 to 23 degrees, he releases the spores. If seawater temperatures rise too high, the seedlings will die. To each net he hand-ties small bags of oyster shells that contain nori filaments. This is a task that continues from early morning to late at night with the help of many colleagues. There are others in Kyushu's Ariake Bay-where Susabi nori has become the norm-besides Koga who are at least choosing not to cave in to the acid treatment trend in an effort to keep Asakusa nori aquaculture alive. 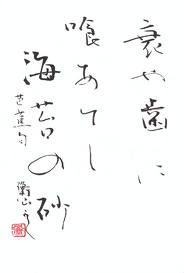 Written in 1691 元禄4年, Basho age 48. Suddenly Basho feels old, by just a small incident at the dinner table. 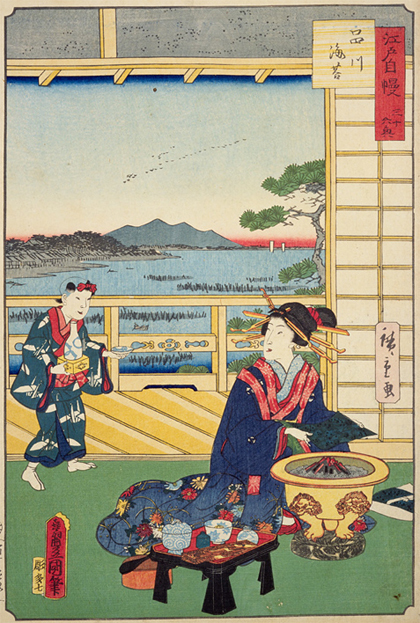 Basho has no need for oysters because he is of age, but to stay healthy he ate dried seaweed. Written in the spring of 1687 貞亨4年春. It seems he observend an old man with a shoulder carrying pole, selling oysters, and wondered if the lighter seaweed would not be a better deal. He visited his disciple Kasuya Chiri 粕谷千里, who lived in Asakusa, Edo, a place famous for its nori even today. The green norijiru soup was served in a light yellow bowl to make a colorful contrast. asagiwan 浅葱椀 "blue laquer bowl"
The bowls are covered with black laquer and then decorated with golden flower and bird design.
. asagiwan 浅葱椀 - Bowls and Haiku . ***** . asagi あさぎ - 浅黄 - 浅葱 hues of light yellow, green and blue . Seaweeds are a daily ingredient in Japanese food. Seaweeds are sometimes called "sea vegetables". Sea vegetables are seaweeds used as vegetables.